German Chancellor congratulates PM on his election victory, but stresses that Palestinian state is only solution to conflict. German Chancellor Angela Merkel on Monday afternoon called Prime Minister Binyamin Netanyahu to congratulate him on his election victory. 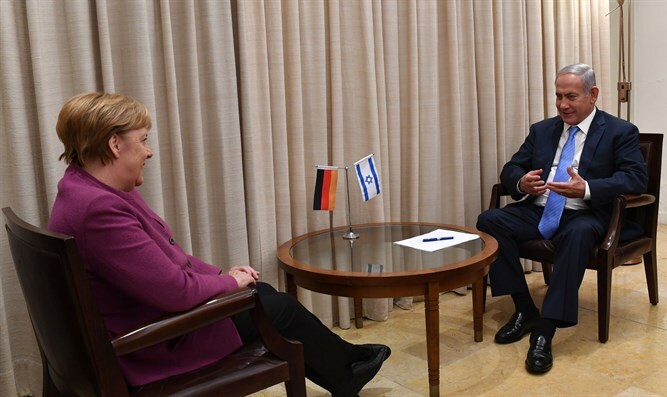 Merkel invited Prime Minister Netanyahu to a meeting in Berlin after the new government is formed. Netanyahu thanked the Chancellor for the warm greetings and welcomed the relations between the two countries. In addition to the congratulations, Netanyahu also heard Merkel’s position on the need to renew contacts with the Palestinian Arabs. The Chancellor stressed that she and the entire European Union are committed to resolving the conflict between the two sides through the establishment of a Palestinian state. The Chancellor’s office said that she also noted that Germany believes that the two-state solution is the right solution for the conflict, despite the repeated attempts to remove it from the agenda. She added that, aside from the Americans, all international elements support this position. On Sunday, former European officials, including former prime ministers and foreign ministers, called on the European Union to reject US President Donald Trump’s proposed Israel-Palestinian Authority (PA) peace plan. According to the officials, who wrote a letter published in The Guardian newspaper, Trump’s so-called “Deal of the Century” is one-sided and biased against the PA. Meanwhile, a source familiar with the plan told The Washington Post on Sunday that it will include practical improvements in the lives of Palestinian Arabs but is likely to stop short of ensuring a separate, fully sovereign Palestinian state. Aides to Trump said last week they expect the president to release his peace plan once Prime Minister Binyamin Netanyahu forms a coalition in the wake of his election victory. These officials added that despite criticism of the administration’s moves to date, the plan will demand compromises from both sides.